Our Custom 18 Oz. Light Up Coconut Cups are available with three and five lights. These fun and unique Cups showcase your design and message on one side of each cup. You can print the cups with your choice of a one- to full color (4CP) print. Three-Light Custom Coconut Cups feature Red, Green, and Blue alternating LED Lights with six different light functions, such as solid-state and blinking. Our Five-Light Customized Coconut Cups feature 5 super bright White LED Lights with three light functions: spinning, blinking and constant-on. The batteries are replaceable for both of these cups. 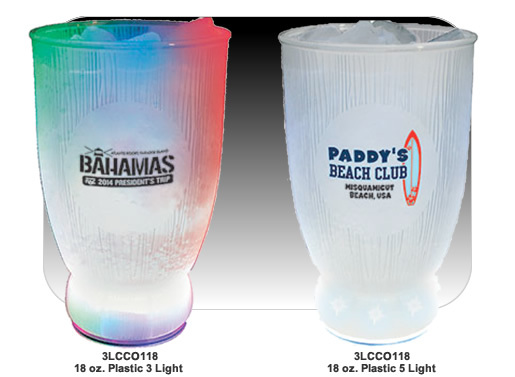 Made in the USA of durable Frosted Styrene Plastic, our Custom Light-Up Coconut Cups can be used again and again. Your satisfaction is guaranteed when you order Custom Plastic Glasses from us. Getting started with your Customized Lighted Coconut Cups is easy. Simply call 1-800-233-0828, and then e-mail to us your camera-ready artwork. Production time is about two to three weeks after approval of your free digital proof. Rush production and delivery is available. For additional information on our Custom Coconut Glasses, please contact us at 1-800-233-0828.